HP DeskJet 1000 is an affordable monochrome and colour printer. This is one of the lower priced printer among other HP printers who provides scanning, copying, fax etc.. functions and rises up with the price. HP DeskJet 1000 supports only print function and is designed for the home user at a reasonable price. It is also referred as CH340B. Although the printer is available at a low price but its high cost HP DeskJet 1000 ink cartridges makes the user think twice before going for it. 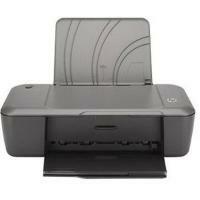 This is a small, neatly-designed, single-function printer in dark grey colour weighing approx. 4.41 lbs measuring 15 x 16.6 x 10.5 inches. The paper tray hinges up from the top of the printer with the storage capacity of 60 sheets of blanks at a time. The output tray is present at the bottom of the printer with the storage capacity up to 25 sheets of papers. There is no display screen, only the power button is present on the top of the printer. The back panel of the printer has two sockets, one for USB connection and the other for low -level power input. The printing speed of this device is 16 ppm for monochrome files with resolution up to 600 dpi and 12 ppm for color files having resolution up to 4,800 x 1,200 dpi. It supports different print medias which includes envelopes, transparencies, labels, iron-on transfers and cards. If you really don’t need a multifunction printer then the Deskjet 1000 is undoubtedly affordable and an attractive printer. It incorporates a small block for power supply, offering low-level power supply thus resulting in energy saving option. However, it is a basic printer with only print function and lacks scan, copy and fax functions which are provided by other rival printers present in the market. Although this is a low-cost printer among all the other HP printers but the HP DeskJet 1000 ink cartridges cost roughly the same as those of its rivals. How to fix print quality problems in an HP DeskJet 1000 printer? HP DeskJet 1000 printer gives high quality black-and-white and color printouts. It is popular for its print quality, but with time certain print related issues like faded prints or missing prints pages may arise. The most likely and common cause for these issues may be low or empty HP DeskJet 1000 ink cartridges. Check the print properties to ensure you have selected the appropriate paper type and print quality from the Media drop-down list. In the Printer Software, click Printer Actions and then click Set Preferences to access the print properties. Check the ink levels from the Printer Software to determine if the HP DeskJet 1000 ink cartridges are low on ink. If they are low on ink, consider replacing them. After installing new cartridges, align them from the Printer Software to ensure high quality output. If the above steps do not resolve the problem, then we would recommend you to contact HP support. Q. Can HP DeskJet 1000 ink cartridges print photos as well, as it prints text documents? A. Yes, these HP ink cartridges print high-quality photos and graphics that look as good as text documents. Q. Do you fill your compatible HP DeskJet 1000 ink cartridges with premium quality ink? A. Yes, we use premium quality ink in the cartridges to provide you consistently good print result and a positive experience of shopping with us. Q. I need a simple, efficient and affordable printer for home use for printing text documents and images. Would you recommend HP DeskJet 1000 printer and compatible cartridges for it? A. Yes, certainly. The HP DeskJet 1000 printer is essentially a straightforward and economical printer that does its job efficiently. You can rely on it to perform all your basic printing tasks that fulfill your home needs. Compatible ink cartridges go perfectly well with this, and as a matter of fact, with any printer; so you can use them and make great savings while enjoying superior quality results. Q. I want to know about your money back guarantee and how it applies to orders. Thanks. A. We assure you of a hassle-free money-back guarantee on purchase of all items. It applies when we are unable to replace any cartridge which is defective so that you experience no loss and inconvenience. Q. Are compatible HP DeskJet 1000 ink cartridges able to print like the original ones as specified by you? Are they manufactured in accordance with official quality standards? A. All cartridges that we offer are manufactured to ensure they meet stringent quality assurance standards and send for sale to customers only if they qualify quality tests. Our products also meet various quality assurance certifications and carry 100% guarantee. Q. What is the shelf life of the HP DeskJet 1000 ink cartridges that you provide? A. The shelf life of these ink cartridges is 6 months. A. Yes, these cartridges are user-friendly so you will experience no inconvenience while using them. They produce superior quality printouts which are the same as those printed by original ink cartridges so you need not worry. Q. Is the ink formulation of HP DeskJet 1000 ink cartridges suitable for different types of media? A. Yes, in fact, many customers who need to use varied media for their work have given positive feedback about the difference these ink cartridges made to their output. Q. Does using compatible ink cartridges make a difference to the environment as compared to genuine cartridges? Are HP DeskJet 1000 ink cartridges really eco-friendly? A. Yes, compatible ink cartridges, including HP DeskJet 1000 ink cartridges, are generally made of recycled HP cartridges, which means lesser e-waste generation. Q. Can I go online and directly find out if a particular ink cartridge is compatible with my printer? A. Yes, you can. Company websites provide a link to a page where you can find out the compatibility of ink cartridges with printers. Q. I was trying to remove one of the HP DeskJet 1000 ink cartridges from my printer but couldn’t release it out of its slot. How can I do it? Please help. A. You need to press down gently on the ink cartridge that you wish to replace in order to release it and then pull it towards you. Q. Is it ok if I re-tape the HP DeskJet 1000 ink cartridges after removing them from the package, in case I want to install them later? A. No, you should never re-tape your new cartridges as it can cause clogs, ink failure or bad electrical connections. Remove the tape only when you are going install them. Q. I have been using the HP DeskJet 1000 printer. But lately, the printer keeps on displaying the “Door Open” message. I have only replaced the old HP DeskJet 1000 ink cartridges with new ones. I am not able to understand why this error message is being displayed? How can’t remove it? A. If you have recently replaced the HP DeskJet 1000 ink cartridges, then there is a possibility that while doing so the cartridge door was not closed properly. You need to open the cartridge door again and check that it has been closed correctly. If the door is not closing properly then there might be some sort of obstructions like packaging material, pieces of paper or tape. Clear the obstruction and check the control panel of your printer. If the message still displays then you need to reset the printer. To do so you have to turn on the printer and disconnect the USB cable and power cord both from the machine as well as from the power source. After 30 seconds connect the power cord and USB cable to the printer and turn it on. The error message will not be seen. Q. My printer is displaying “Ink Cartridge Failure” error message. I have just changed the ink cartridge. What is the cause of this problem? Do I need to buy HP DeskJet 1000 ink cartridges and replace again? A. No. You do not need to replace the HP DeskJet 1000 ink cartridges again. This problem can arise due to many reason. First of all, you should uninstall the ink cartridge. To do so, turn the printer on and open the lid. The cartridge carrier will move to the corner. Now open the carrier door and gently press the HP DeskJet 1000 ink cartridges to remove them from the slot. Inspect these cartridge. Check the electrical contacts, noodle and see that the protective tape has been removed from the nozzles. If not then do it. Repeat the same steps for the other HP DeskJet 1000 ink cartridges as well. Now reinstall these cartridge. Make sure that when you reinstall, you place the ink cartridges into the slots respective to the colors. You should check the contacts of the ink cartridges. These might not be clean and therefore the printer is having trouble identifying the ink cartridges. Take a clean cloth and distilled or filter water. Clean the contacts using the cotton swabs. While you clean, be careful that you do not keep the HP DeskJet 1000 ink cartridges out for more than 30 minutes. If the ink cartridges stay this way, the ink in the nozzle will dry and clog it. You should also clean the printer contacts using the cotton swab. Q. Why am I seeing “Paper Mismatch” Error message on my computer screen? I use a Mac. What is the procedure to clear this message? A. Select the File option followed by Print. You will see a drop-down list of the printers. Select your HP DeskJet 1000 printer. Now click on Page Setup. Here you have to elect the Paper Size option. Select the paper size that you have loaded in the input tray of your printer. If the list does not mention the size of the paper that you have loaded then select the nearest option. Click on Ok and try to take a print. If the error message is still there then you have to reset the printer. When you reset the printer then the present settings will be overridden and you will not see the Paper Mismatch error message any more. You will be able to use the printer easily.